Having spent 20 years and nearly $9 billion building what will be the world’s most powerful eye in the sky, scientists working on the James Webb Space Telescope have finally reached a big day — though not yet the biggest. “Today, we’re celebrating the fact that our telescope is finished,” senior project scientist John Mather said at a NASA news conference Nov. 2. “We’re opening up a whole new territory of astronomy,” said Mather, who is also a Nobel Prize-winning physicist for his work on the cosmic microwave background radiation. An even bigger day will come in late 2018 when, if all goes according to plan, the Webb telescope will be launched into orbit and will start delivering images of the universe’s far reaches never before seen by humans. Its powerful infrared vision is designed to detect galaxies more than 13 billion light-years away. Because the light emitted by these galaxies takes so long to reach us, in a sense Webb is traveling back in time to snap a picture of what the universe was like right after the Big Bang. Webb can also peer through dusty cosmic clouds to capture the formation of new stars. These dust clouds almost completely block the view of the 26-year-old Hubble Space Telescope, which mainly sees in visible and near-infrared wavelengths instead of longer, dust-penetrating infrared. Once Webb is in orbit and fully functioning, the images it will beam back to Earth are expected to reveal the birth of stars in unprecedented detail, according to Mather. Scientists will be able to “take the covers off and see inside their nursery,” he said in a recent lecture at George Washington University. Webb’s powerful vision comes from its big, gold-coated mirror that maximizes the collection of infrared light. The mirror is about 21 feet in diameter, three-stories tall when tilted on its side. Webb’s mirror is six times larger than Hubble’s mirror, and too large to fit into any rocket. So during Webb’s planned launch in October 2018, the mirror will have to be folded and then unfurled once it gets to space. Webb sees not only super-far but also super-precisely. According to Mather, from its spot orbiting Earth Webb would be able to detect a bumblebee on the moon — 250,000 miles away. With such precision, Webb will be able to examine the atmosphere of planets that are outside of our solar system, searching for possible signs of life. 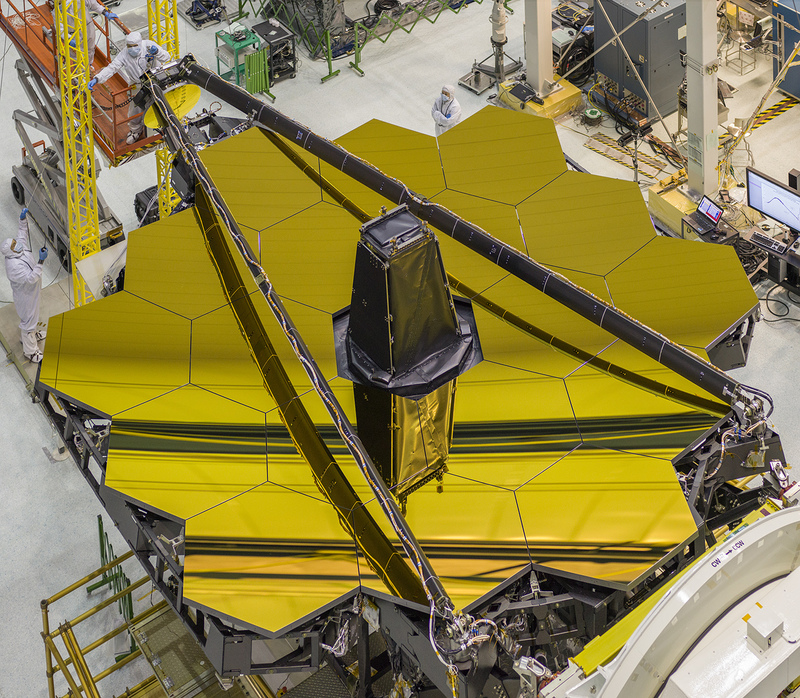 “The James Webb Space Telescope is very exciting for us astronomers doing exoplanet research,” says Didier Queloz, professor of astrophysics at Cambridge University and Geneva University. His team plans to use Webb to observe a list of Earth-like exoplanets. Mather expects to be barraged with requests from researchers hoping to use Webb. “I figure every astronomer in the entire world is going to send us a proposal,” he says in an Are We There Yet podcast from October.